Coast cottage sits in approx quarter acre of pretty enclosed garden opposite the church and vicarage in the Northumbrian coastal village of Longhoughton, which lies 5 miles east of Alnwick. This is an ideal holiday location for exploring the Northumberland Heritage coast and is only minutes from the beautiful beach Sugar Sands, accessible by car or on foot down a quiet single track lane. 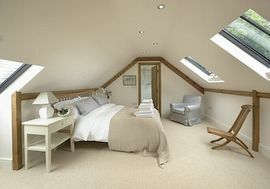 There are four double bedrooms (three king size, one twin) with lovely comfy beds and linen. Three well appointed bathrooms with great showers and roll top bath. 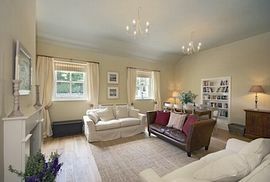 There is also a stunning 21 foot long sitting/dining room with squashy sofas and a wood burning stove. 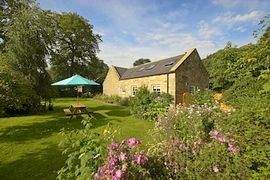 This together with the well equipped country kitchen and range cooker make it the perfect holiday base for your visit to Northumberland. 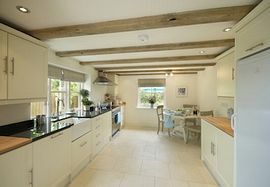 The cottage is accessed down a private lane with parking for four cars. The delightful enclosed rear garden is ideal for families and barbeques. Whether you are puffin or seal spotting, walking, golfing or just want to enjoy your holiday chilling out on the beach Coast Cottage has been designed to offer you a very special place to relax and unwind and enjoy your holiday in Northumberland. It's also an ideal location for visiting Alnwick Castle and the world famous Alnwick Garden. Lots of child and baby equipment . Large enclosed pretty cottage garden , outdoor furniture , Bicycles .Near beautiful sandy beach.On site parking for 3 cars. Local Services: Good village shop, pub, church and coastal bus route all walking distance. Coast cottage sits in approx quarter acre of pretty enclosed garden opposite the church and vicarage in the Northumbrian coastal village of Longhoughton, which lies 5 miles east of Alnwick. This is an ideal holiday location for exploring the Northumberland Heritage coast and is only minutes from the beautiful beach "Sugar Sands", accessible by car or on foot down a quiet single track lane. Nearest Train Station Alnmouth distance from cottage 5 miles. Gold Award for excellence from Visit Britain.